And the ultimate result? 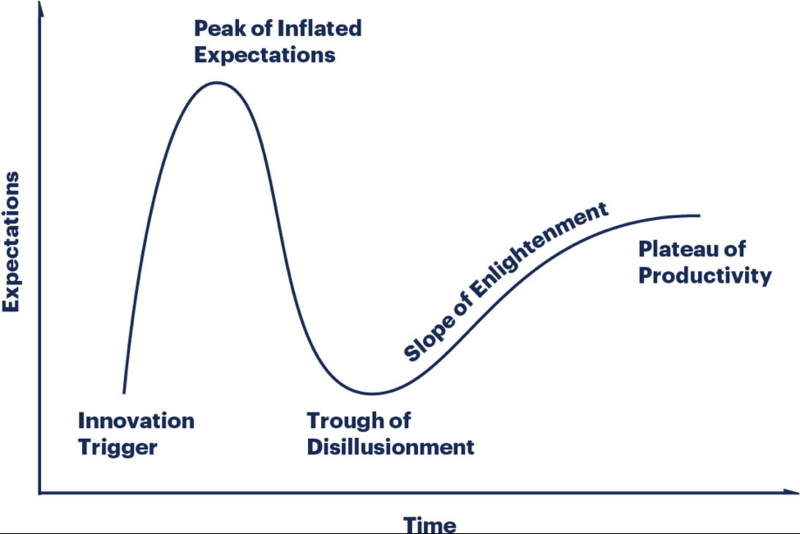 The technology is forced to traverse the infamous Gartner Hype Cycle, soaring to the Peak of Inflated and Totally Unrealistic Expectations and then traveling down the slippery slope into the Trough of Disillusionment (also known as the Trough of CLM: Career Limiting Moves), before finding its rightful footing and starts to deliver business value (see Figure 1). Note: Hats off to Gartner for institutionalizing the Hype Curve and using it as an effective way to show how screwed up IT is in adopting new technologies. The path to the Plateau of Productivity is a long slug, and many careers and hundreds of millions of dollars will be wasted along the journey. But it shouldn’t be this waybecause the ultimate cost is much higher than just the costs associated with the Peak of Inflated Expectations. Let me explain. 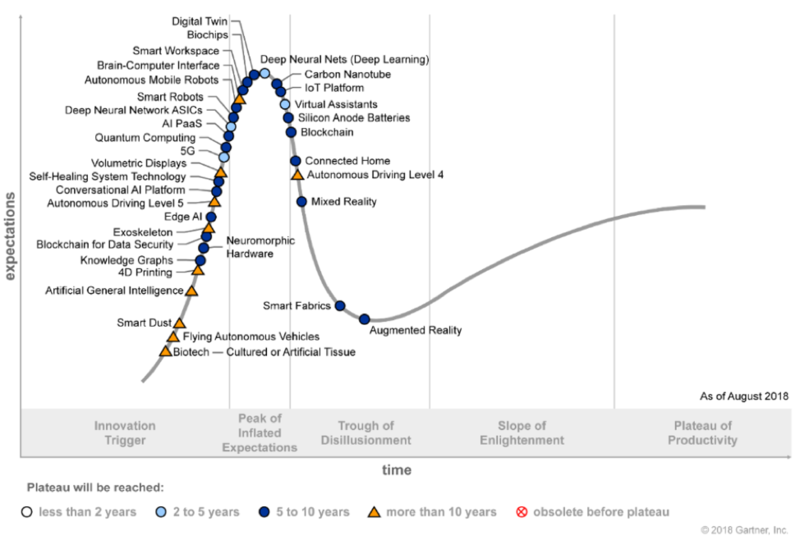 Figure 2 shows the 2018 Gartner Hype Cycle for Emerging Technologies, all promising technologies for which the vast majority will never reach their full potential. Lots of interesting technologies including Smart Dust (where’s that darn vacuum? 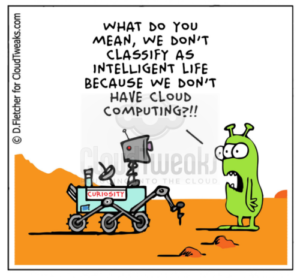 ), flying autonomous vehicles (UFO’s? ), blockchain (…yet again), and quantum (leap) computing. Some of these technologies will eventually navigate the Hype Curve to provide business value by solving strategic and meaningful business problems. But the path to get there is very expensive. 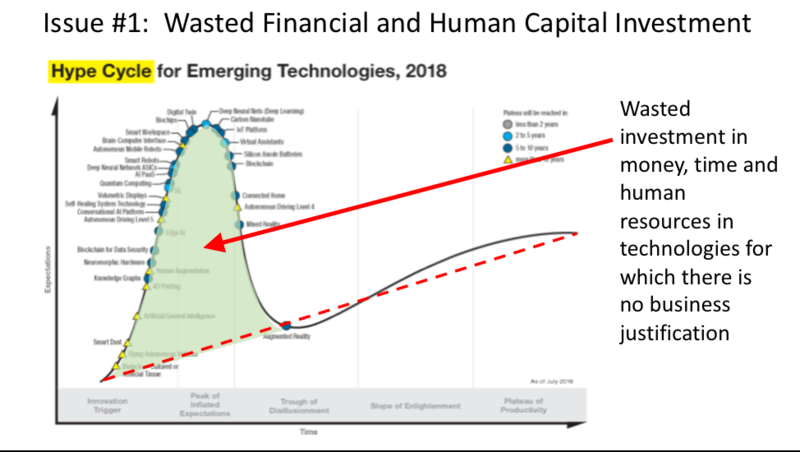 The green area underneath the “Peak of Inflated Expectations ” in Figure 3 reflects wasted investments in money, time and resources in trying to “monetize” or “commercialize” technologies for which there is not yet business justification. 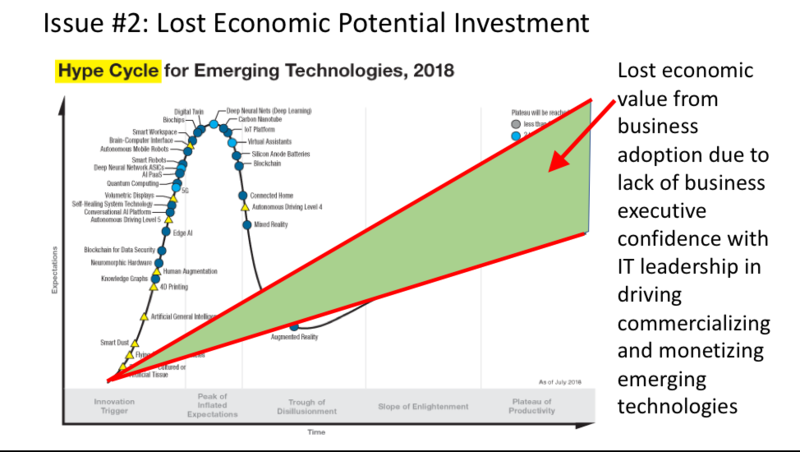 But probably the bigger cost for emerging technologies is the lost economic potential for emerging technologies that gets mis-positioned early in the Hype Cycle and never gains the level of organizational adoption necessary to drive material business and financial impact (see Figure 4). It’s the ultimate “Field of Dreams” moment with non-scientists cranking away on science experiments. While there is value in organizations getting familiar with new technologies, the technology Proofs of Concepts should NOT be inflicted upon business stakeholders with over-fabricated expectations of grandeur. Business users long ago stopped believing in the “Silver Bullet” solution – a simple and seemingly magical solution to a complicated problem. How does our technology industry avoid these two costly mistakes? What steps can we take at the introduction of an emerging technology to avoid having to traipse along the Hype Cycle to achieve economic value from that technology? Here’s my recipe. It’s really simple: Understand your organization’s key Business Initiatives. Understand what’s important to the organization from a business, financial and/or customer perspective. Stephen Covey said it well: “Begin with an end in mind.” While we may not understand the technology journey that we’ll experience trying to reach that end, the end point should not be a mystery. Any emerging technology initiative – big data, artificial intelligence, IoT, blockchain, quantum computing, particle beams, invisibility rings – should start by understanding the organization’s business initiatives. Then conducting envisioning workshops with key stakeholders to identify, validate, vet, value and prioritize the use cases that emerging technology might support. See the blog “The #1 IOT Challenge: Use Case Identification, Validation and Prioritization” for more details on the tools and techniques to help drive this envisioning process. While having a business goal is critical, it is important for IT to gain familiarization with how the technologies work, what might be required to support the technologies, and what sorts of problems can potentially be addressed with these emerging technologies. Attend conferences, read articles, attend meet ups…but realize that you can’t always believe what you hear or read (as you read this blog). So organizations are going to need to create their own sand boxes and labs where they can safely gain some hands-on experience with these technologies. 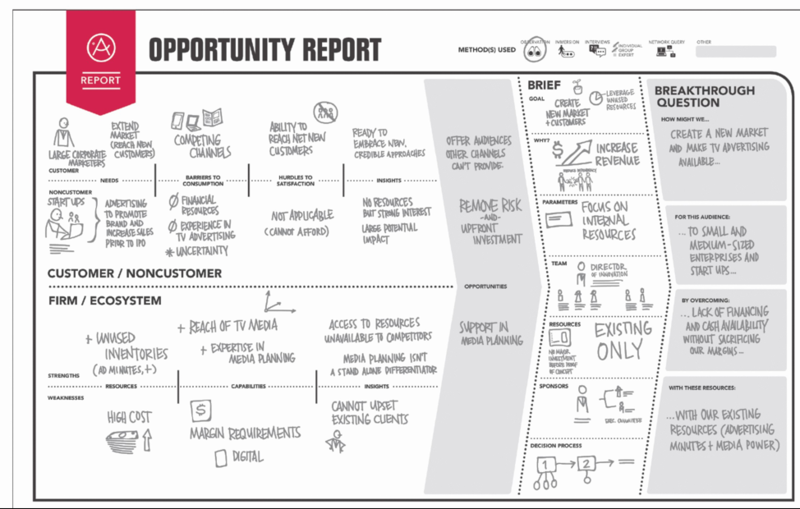 This is a great chance to leverage Design techniques like the Opportunity Report (See Figure 5). “You can’t get to the What and the Why by focusing on the How.” So having a business frame (e.g., reduce unplanned operational downtime, improve customer retention, reduce hospital readmissions, improve 5 year graduation rates) around your technology exploration process will ensure that what you are exploring will ultimately have economic value to the organization. 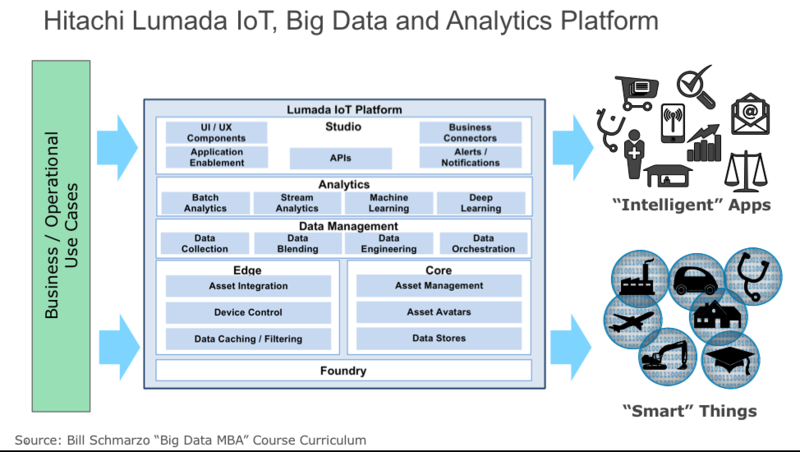 Next, organizations must create an architecture that leverages big data, IoT, advanced analytics and application development to deliver “intelligent” applications (applications embedded with artificial intelligence that get smarter with every customer interaction) and “smart” entities (that leverage edge-to-core IOT analytics to create “continuously learning” entities such as cities, cars, airports, hospitals, utilities, schools). See Figure 6. See the blog “Internet of Things: Getting from Connected to Smart” for more details on creating smart entities. Finally, embrace Design as a way to drive organizational alignment and adoption. 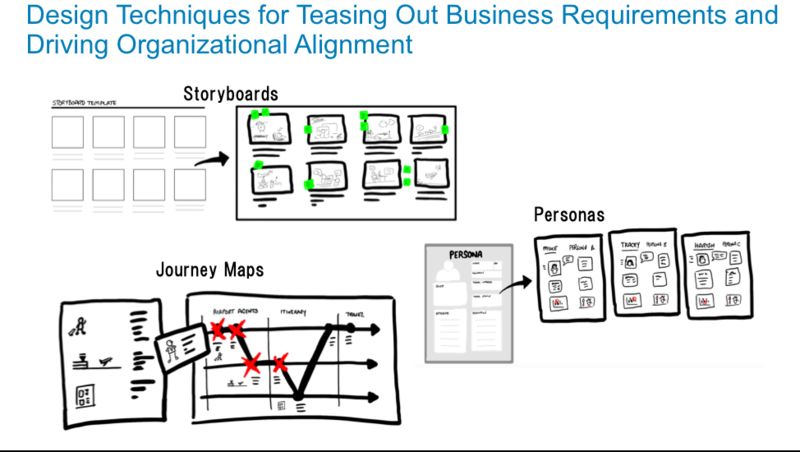 While it is popular to think of Design and Design Thinking as techniques for uncovering customer, product and market requirements, these same tools can also drive organizational alignment and adoption with respect to where and how these emerging technologies can be best deployed to drive meaningful business value (see Figure 7). 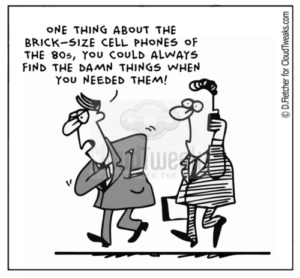 What good is this new technology adoption approach if we don’t have the commitment of the organization to actually use the technologies to drive new sources of business and customer value? While technology werewolves may exist, the silver bullet to kill them does not. Bill Schmarzo, author of “Big Data: Understanding How Data Powers Big Business” and “Big Data MBA: Driving Business Strategies with Data Science”. He’s written white papers, is an avid blogger and is a frequent speaker on the use of Big Data and data science to power an organization’s key business initiatives. He is a University of San Francisco School of Management (SOM) Executive Fellow where he teaches the “Big Data MBA” course. 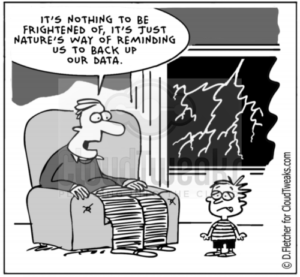 Bill also just completed a research paper on “Determining The Economic Value of Data”. Onalytica recently ranked Bill as #4 Big Data Influencer worldwide. 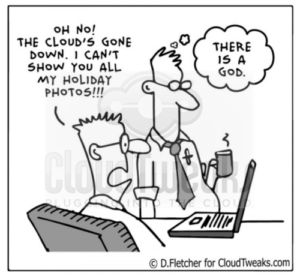 CloudTweaks Q&A: How Smart Will Your City Be by 2025?